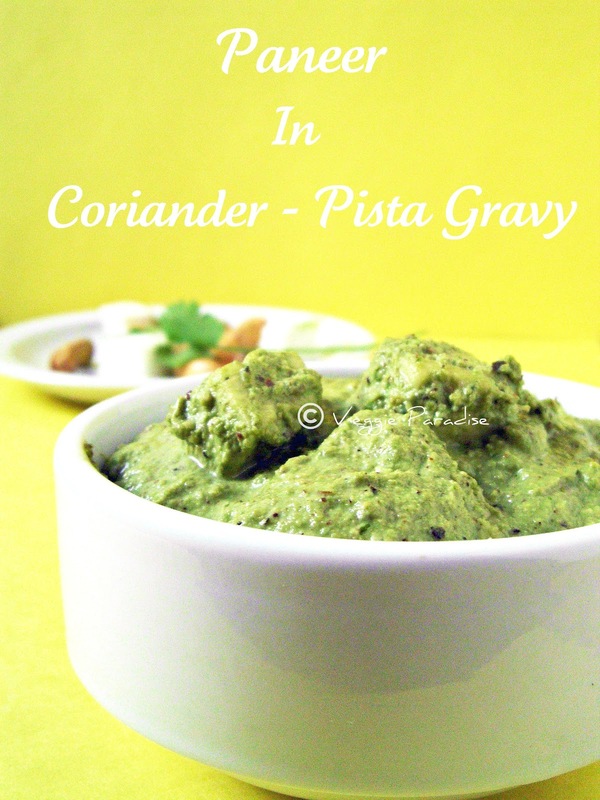 Paneer in Pista Cilantro Gravy - This is a rich and creamy dish with paneer.The fragrance of coriander leaves and the nutty taste of pista , sure makes this gravy taste great. 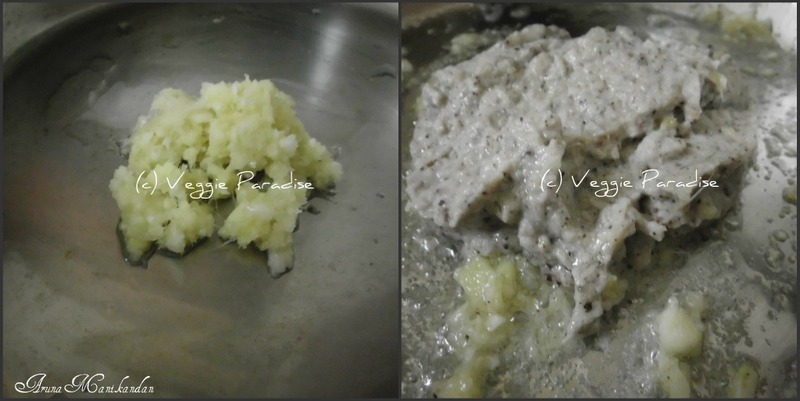 I saw this recipe in a cookery show and have made quite few changes according to my taste.It is very easy to prepare. the procedure is also quite simple and definitely is worth trying it .Serve this with hot roti's and nothing else. 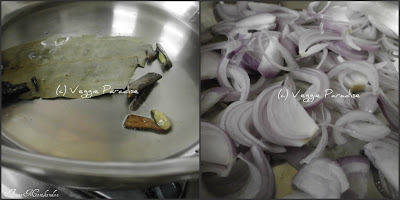 Heat oil in a pan and fry the spices(bayleaf, cardamom and cinnamon stick) for a min. Add the onion and fry until soft. Allow it to cool and whizz the mixture in a blender. Now grind the soaked pista along with green chillies and coriander leaves to a smooth paste, by adding little water. Heat oil in a pan, add the ginger - garlic paste and fry for a few seconds. Now add the onion mixture and fry for a minute a so. Keep stirring to prevent it from sticking. Add the grinded pista gravy along with salt and mix it well. Fold in the paneer and simmer for a couple of minute. Before taking off from the heat,add cream .Crumble in the fenugreek leaves and stir well. WOW!!! Looks yum,love the first click. Rich gravy and protein fortified paneer to go in it! 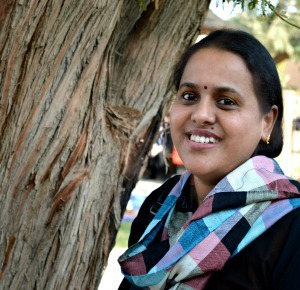 very nice recipe Aruna. I think i shall use the paste in other vegetable too. 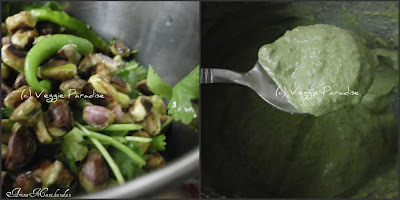 Its very interesting recipe.Its similar to pesto. Wow! Beautiful picture! Rich & flavorful curry! oh this dish would taste heaven with tandoori rotis.. 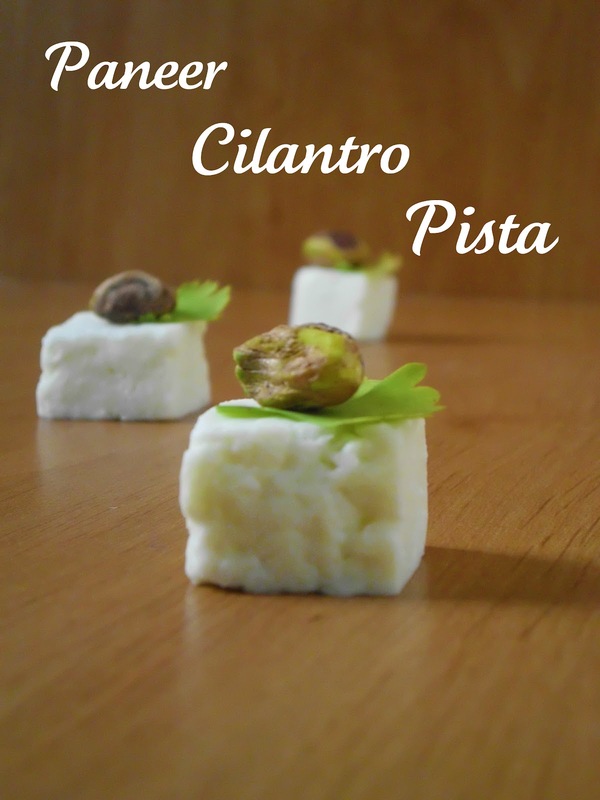 Delicious recipe with beautiful clicks. wow!! !looks so tempting and delicious,the picture s make me drool.Bookmarked. Rich and yummy gravy, very beautiful pics too. Such a rich gravy, shud have tasted great..
Great presentation and looks very tasty! I admire your creativity in making this gravy. Love the first click, awesome curry. Beautiful pics, delicious looking curry. 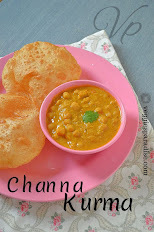 Omg, super rich looking delicious curry..Lovely clicks Aruna..
Nice. 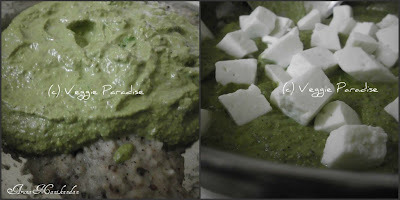 Different from the usual paneer recipes. Unique recipe,looks super tempting,love the color and flavor..
wow super gravy..it tastes awesome. this is such an interesting and novel recipe, luv it! 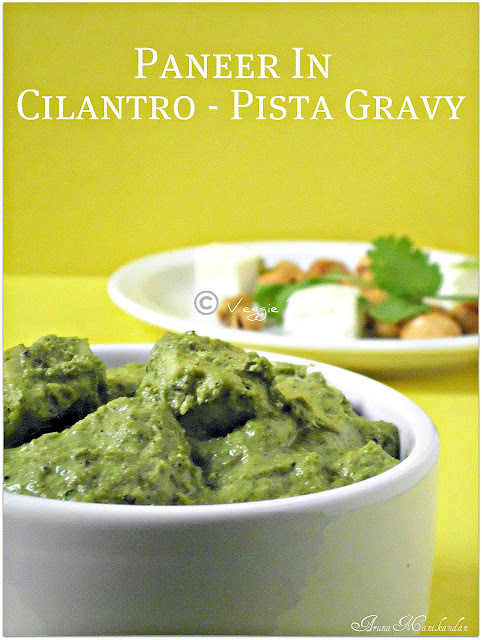 Amazing gravy wonderful method of using pistas..
what an incredibly beautiful way to cook paneer and such beautiful pictures! Lovely color. it sounds unique! I have some pista sitting in the freezer for long time without knowing what to do with it! Thanks a ton for sharing this recipe! Am glad to follow u dear ..